Examples, solutions, videos, worksheets, and activities to help Algebra students. 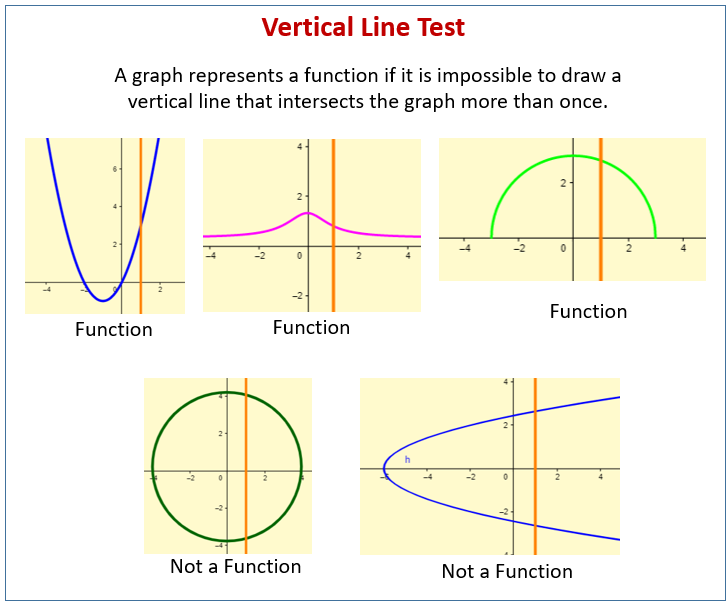 The following diagrams show the Vertical Line Test that can be used to test whether a given graph is a function. Scroll down the page for more examples and solutions on functions and how to use the Vertical Line Test. In mathematics, a relationship describes one quantity in terms of another. A function is a type of relationship in which for each first component there is one and only one second component. In mathematics, an introduction to functions and how to identify whether or not a relationship is a function is very important building block since a lot of complex topics in upper-level math involve functions. This video introduces the definition of a function, domain, and range. This video shows how to graph a function and how to determine the domain and range of a function. When we put two functions together, we have something called a composition of functions. For example, the expression g(f(x)) states that we should put the "f" function into the "g" function. To do this, we simply substitute the entire inner function into each of the variables in the outer function.